Salvatore Riina, the Mafia’s murderous “boss of bosses,” who earned multiple life sentences and the nickname the Beast for his cruelty and for unleashing a war against law enforcement that claimed the lives of Italian prosecutors and police officers, died early Friday in a hospital in the northern Italian city of Parma. He was 87. The Ministry of Justice announced his death. He had recently undergone surgery and been placed in a medically induced coma. 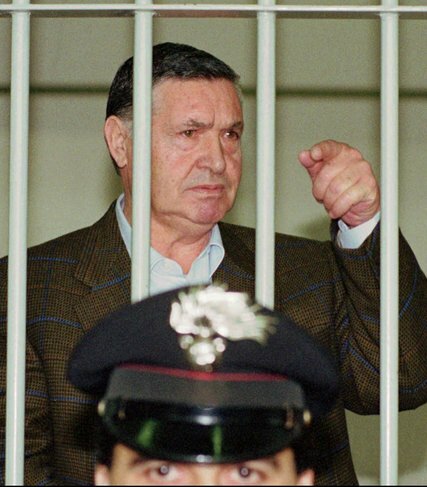 As the head of Sicily’s infamous Cosa Nostra crime syndicate since the 1970s, Mr. Riina, known as Totò, had a long criminal reach that spilled blood across Italy and extended a black hand of extortion and trafficking across the globe. He retaliated against the Italian government’s campaign to crush the Mafia by striking back hard, ordering in 1992 the bombing assassinations of two leading anti-Mafia magistrates, Giovanni Falcone and Paolo Borsellino. He also orchestrated the kidnapping, strangling and dissolving in acid of the young son of a mob informer. 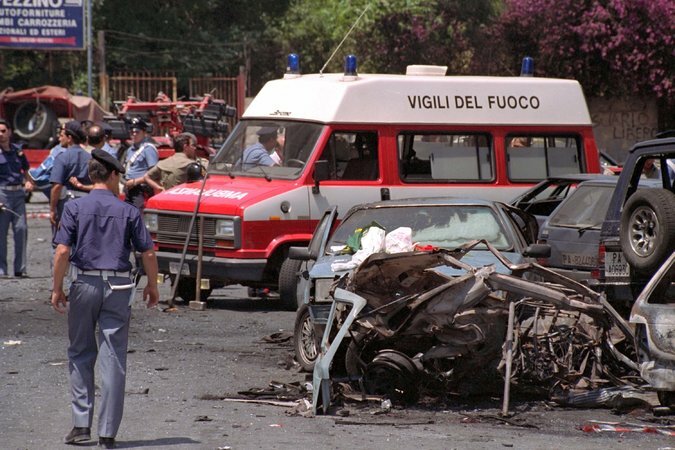 A car bombing ordered by Mr. Riina killed Paolo Borsellino, Sicily’s top anti-Mafia investigator, and his bodyguards in 1992. In 1993, the Italian authorities captured Mr. Riina in Sicily’s capital, Palermo, and judges ultimately gave him 26 life sentences. He spent a good deal of the next quarter-century in isolation, with little time outside his cell in Milan. The Italian justice minister, Andrea Orlando, allowed family members to visit Mr. Riina in the hospital on Thursday, his birthday. He had four children, one of whom, Salvo, wrote on Facebook, “You’re not Totò Riina to me, you’re just my dad.” Another of Mr. Riina’s sons is in prison for committing four murders. Mr. Riina, who was rife with nicknames — he was also called U Curtu, or Shorty, because of his 5-foot-2 height — came from Corleone, a town in the Sicilian hinterland made famous as the birthplace of the fictional character Vito Corleone in the “Godfather” movies. But Mr. Riina’s butchery was all too real. After serving time in his youth for killing a man in an argument, he became a soldier under the Mafia boss Luciano Leggio. He rose through the ranks, eliminating competitors and at times running his gang in hiding, though apparently always from Sicily. By the early 1980s, Mr. Riina had solidified his dominance over the island and its global criminal activities. Salvatore Riina was placed behind bars in the courtroom during a trial in Rome in April 1993. His organization’s tentacles reached deep into all facets of Italian life, from small businesses forced to pay for protection, to large sectors of commerce, where they skimmed millions of dollars. In Sicily, the mob had a reputation for delivering votes in exchange for favors. And nationally, Italy’s leading politicians were often accused of entanglements with the sticky, and often invisible, Mafia web. Mr. Riina’s onetime driver, who became a state informant, alleged that Giulio Andreotti, a former prime minister who dominated postwar Italian politics, once exchanged an embrace and kiss with Mr. Riina. Mr. Andreotti denied it. The codes of omertà, or silence, that governed the Mafia and protected its bosses began to erode in the 1980s as rival families and informants turned state’s evidence. Enormous trials in the early 1990s resulted in the arrest and jailing of more than 300 gangsters. Tommaso Buscetta, a crucial Mafia turncoat living in the United States under witness protection after losing out to Mr. Riina in Sicily, began to testify in such trials in 1984. He eventually mapped out a criminal organization presided over by Mr. Riina. In response, Mr. Riina is said to have ordered the murder of Mr. Buscetta’s two sons, his brother and 33 of his other relatives. 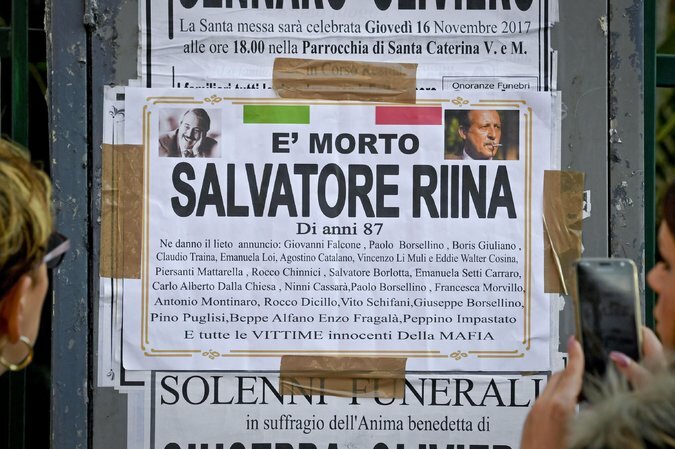 A mock public funeral poster announces the death of Mr. Riina in Ercolano, near Naples, on Friday. It lists the names of Mafia victims, including the magistrates Giovanni Falcone and Paolo Borsellino. But it was the bombing murders in Sicily of the two anti-Mafia magistrates, Mr. Borsellino (and five of his bodyguards) and Mr. Falcone (along with his wife and two bodyguards) that shook Italians the most and doomed Mr. Riina. Subsequent bombings in Rome, Milan and Florence in 1993 led to the crackdown on the Mafia and also contributed to the collapse of an old political guard corroded by corruption. Upon Mr. Riina’s arrest in 1993, the mayor of Corleone at the time proclaimed it “a moment of liberation for us.” Children were let out of school to celebrate. 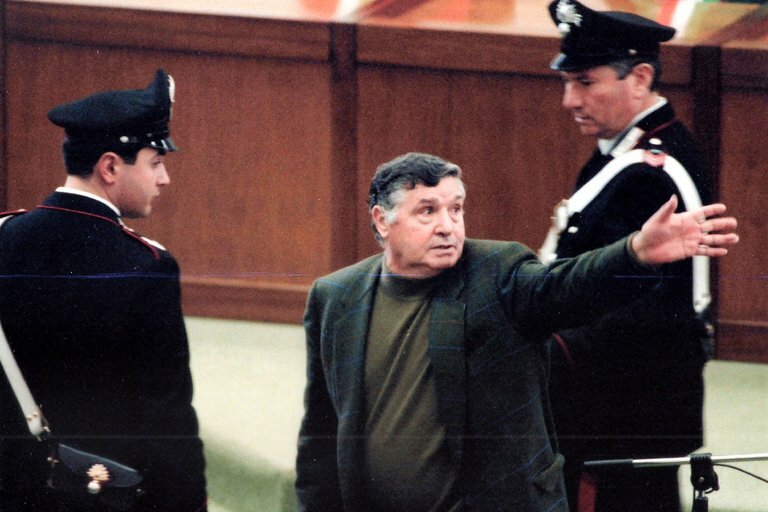 Bernardo Provenzano, who died last year, succeeded Mr. Riina in 1993 as the operational “boss of all bosses.” But even from prison, Mr. Riina found a way to continue his brutality, ordering the kidnapping and strangling of the 14-year-old son of an informant. The boy’s body was then dissolved in acid. With Mr. Riina in prison, other mobs around Italy grew in brutality and influence, including the Camorra in Naples and the ‘Ndràngheta from Calabria, which operates a worldwide drug trade. But the specter of Mr. Riina, who rarely spoke in public, hung over the country. In one of his 1993 trials, he refused to address the allegations of one of his accusers. “He does not have my moral stature,” Mr. Riina said.